WARNING: The islands are disputed territory, claimed by China, Taiwan and Vietnam. As of May 2017, the situation is on edge, with China and Vietnam moving naval vessels about and making hostile statements. The Paracel Islands are an archipelago in the South China Sea, administered by China, but also claimed by Taiwan and Vietnam. China has announced plans to open the islands to resort-style tourism, starting with Yongxing Island. This tropical archipelago, about one-third of the way from central Vietnam to the northern Philippines, is composed of 130 small coral islands and reefs divided into the northeast Amphitrite Group and the western Crescent Group. It is surrounded by productive fishing grounds and by potential oil and gas reserves. In 1932, French Indochina annexed the islands and set up a weather station on Pattle Island; maintenance was continued by its successor, Vietnam. China has occupied the Paracel Islands since 1974, when its troops seized a South Vietnamese garrison occupying the western islands. 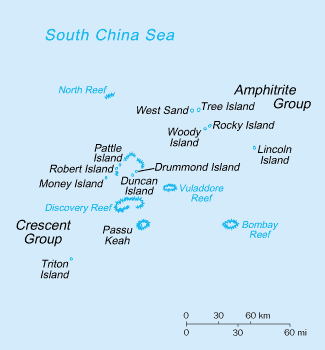 The islands are claimed by Vietnam and Taiwan. Due to the sensitive security situation, China only allows Chinese nationals to visit the islands. Access is denied to foreign visitors and to residents of Hong Kong, Macau and Taiwan. China has built an airstrip on one of the islands. Small Chinese port facilities on Woody Island and Duncan Island are being expanded. Although the economic value of the archipelago's waters for fishing, and the suspected presence of underwater petroleum reserves are their primary source of interest, there is no economic activity taking place on the islands. There are no public accommodations in the Paracel Islands. This city travel guide to Paracel Islands is an outline and needs more content. It has a template, but there is not enough information present. Please plunge forward and help it grow!